Custom events are available in Pro, Expert and Enterprise plans. Fired custom events count as page views in your monthly quota. Events must be configured by someone with technical skills. The display of a pop-up can be triggered by a custom event. Custom events allow you to link WisePops with any kind of user activity on your website. A custom event can be set as display trigger for a pop-up in the Display Scenario modal. Just give it a name! You can fire a custom event as soon as the WisePops tracking code has been executed. "event": a string that indicates that you want to fire a custom event. Leave it as it is. "my-custom-event": the name of your custom event. This section gives two commonly encountered examples. 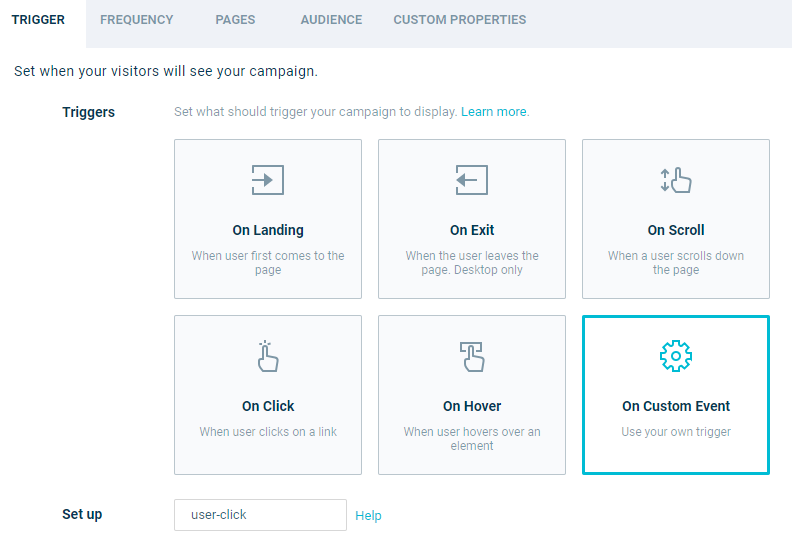 In this example, we will set up a custom event fired on a user click. The snippet return false; tells the browser not to follow the link provided in href. Now, try clicking the link or the button. 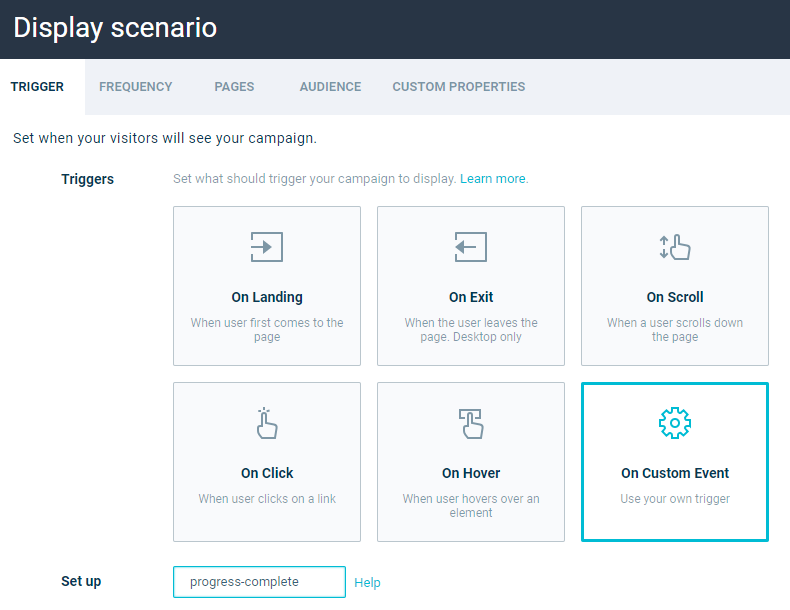 If the rest of the display scenario is matched (display options and target visitors), the pop-up will show up. In this example, we will set up a custom event for the jQuery Progressbar completion. 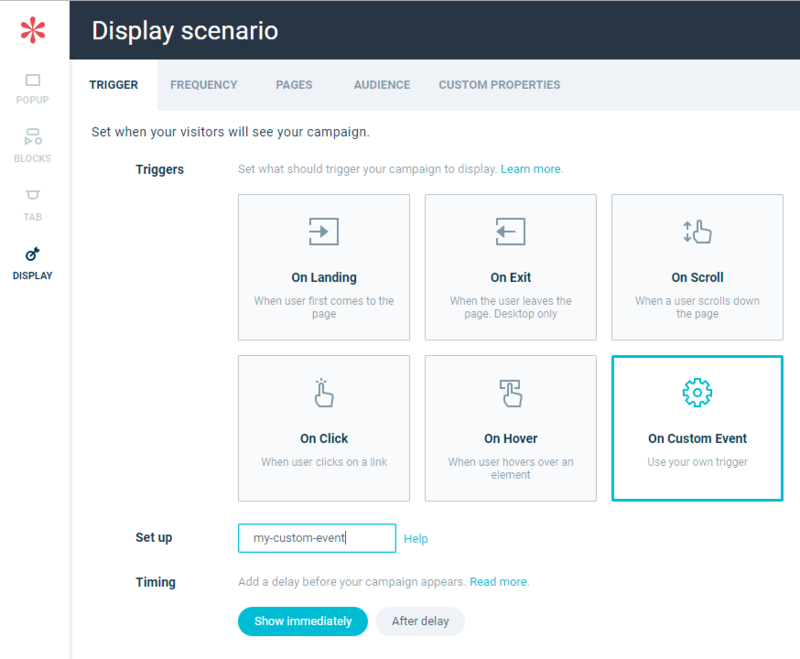 The pop-up will be immediately displayed if its display scenario is matched (display frequency, location targeting, etc.). S.P.A. are websites that do not reload the document when the page changes. Instead, the new content is injected into a container, and the URL is dynamically changed. If the wisepops() function is not defined, please make sure that the WisePops tracking code is up-to-date. It should start by (function(W,i,s,e,P,o,p) . You can view some WisePops activity logs through the browser console. Go to your website, where WisePops is installed. Open the developer tools by hitting F12, and click on the "Console" tab. Inside the console, type wisepops("log") and hit Enter.